JERSEY CITY, New Jersey -- Video featuring two young New Jersey brothers skillfully spinning pizza dough has gone viral on social media. 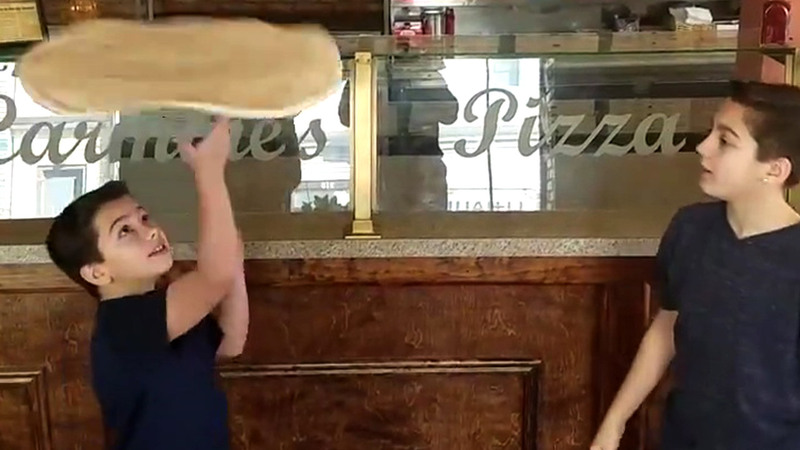 The video, posted by 10-year-old Michael and 12-year-old Nicholas Testa on Facebook, shows the boys tossing and spinning the dough inside their father's pizza shop -- Carmine's Pizza Factory in Jersey City. They titled it, "Practice makes perfect!!" So far, the video has been viewed more than 14 million times and shared nearly 200,000 times since it was posted February 20. The reactions on Facebook have been both supportive and funny. "I can barely walk in a straight line sober and these kids are like the Harlem Globe Trotters of pizza lol," Rich Tiemann wrote. "Dude. That's serious skill!!" Samantha Trate wrote. One person even brought up what some New Yorkers may consider fighting words. "This is why jersey has better pizza than NYC. #tradition," Aaron Magnifico wrote. "Thank You soooo much. 10,000,000 views and climbing!! That's a lot of pizza lovers!! #pizzalife." You can follow the boys' adventures on Instagram: @nicktesta8 and @t3esta28.